Moved to the Warm Room. The laptop was here. Denis had had it connected to the Paramount. Denis went to bed early. So to get up early. He's off to Cold Water. No messages, lately, from Ian. Jujubes! The last few. Nom nom. Oh dear. Just discovered I was in the wrong list! When outside trying to view naked eye double stars, I thought I had been in Lodriguss's list. Nope. I was in the RASC double/multiple list! Jerry doesn't have anything in Cassiopeia. And he does not refer to Dabih in Cap. Did I really see anything then...? Not dewy tonight! Checked the weather. No surprise. It stopped collecting data on the 2nd at 7 o'clock. Set about rebooting it. Noticed the Sky Quality Meter was getting 21 readings. Fairly consistent with mine hand held. Reviewed priority items from my weekend observing plan. Dan asked for some pliers. Grabbed a red flash light and headed over to the garage. Found some, lineman's and classic. As we walked over, I noticed it was rather bright inside the garage. I just assumed it was the blue LEDs on the security system but when I looked at the box I saw one of the incandescent light bulbs was on! The thermostat must have tripped. It was around 10 degrees. I turned it down to zero. 12:50 AM. Micheal was leaving, after meeting Dan. Noodled on my next activity. Considered imaging double stars. Mirfak, for example. It was in my View Again list. I dunno. Why not. Hooked up the focusing gear. Went to the house for a few items. Some red wine. Hooked up the camera imaging gear. Damn! I have forgotten to cover the green LED on the new USB-ethernet adapter. I homed the mount. The local conditions. As of 12:46 on Sep 4. Wind 9.7, from the south-south-east, high was 16.1, humidity 79%, barometer 1023.4, temperature 14.3, with a very slight wind chill of 13.9. Camera was on battery... Turned it on. Saw the EOS Utility launch. Could not see the Optec software under Denis's profile. Logged into mine. Started gross focusing. Could not activate the Live View on the camera back while attempting to aim and focus. Strange. Was certain I had done that before. Wanted to use the Tele Vue to aim but discovered it was without eyepiece. And then found the security cabinet locked! Oh boy. Tried using the University Optics finder but ran out of range! Something wrong with the bracket? Need to fix that. Light bulb. My eyepieces were here. Popped in one of mine in the TV 101. Crudely focused running back and forth. Opened the motion control window in TheSky 6. Centred the star. Closed EU. Launched Backyard EOS. Maximised it on the external monitor. Oh yeah. Forgot that I have the ASCOM Focuser option. Gotta try that some time. 1:33. Battery was reading as medium. Four bars. Switched to focus mode. Live mode was already on. Started focusing with the software app on the laptop. Started focusing in. Was at FWHM of 9.4. Got 8.8. Then 8.5. It was going up. Dropped the step from 100 to 50. Went out. Chasing the seeing. Out some more. Shut down extra apps on the netbook to free up some cycles. Went out again. Incremented to 10. Was at 3066. Broke, now at 8.4. I was at 3046. Set to Auto A. Set the target name. Mirfak. Made a note to shoot darks. For the aurora. I had forgotten last night. Tried a single shot. 1 second. Couldn't see anything. Tried a 10 second shot. The timing looked funny. Was the self-timer affecting things? Earlier I had seen the message in EOS Utility. Checked the camera directly. It was OK.
Wow. I wanted Mirfak. 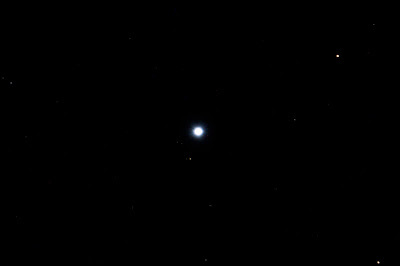 Mirfak aka α (alpha) Persei was the same in SkyTools and TheSky. Oops. I had SkyTools on Algol. 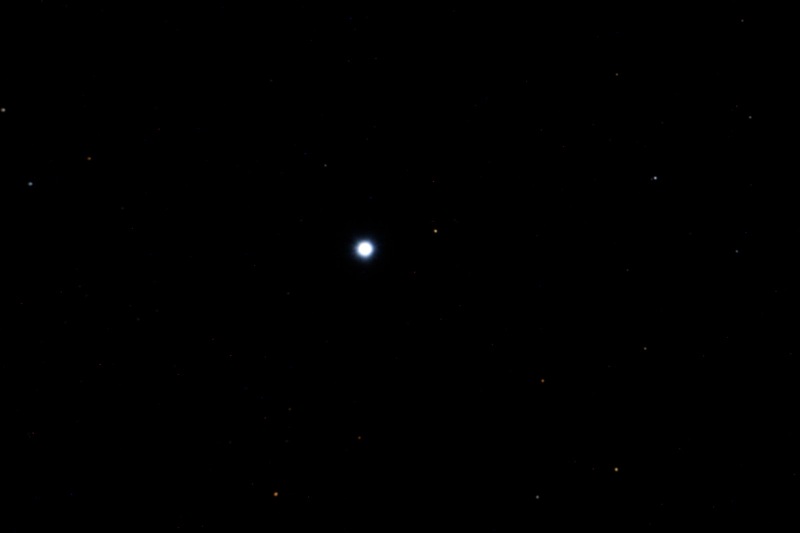 I had been comparing the software (on Algol, a multi-star system) to the image. Different. Mirfak is not logged in ST3P. I had marked it high priority. It was in my View Again. In TLAO. In EU. It shows as a double and a suspected variable. The primary is super-bright. Magnitude 2 vs. 12. I did not notice the B star in my images.  It is just barely visible in the 10 second image. It was obvious in my 20 second shot, though it was trailed. This, and all shots here: Canon 40D, Celestron 14 SCT, f/11, ISO 1000, RAW+JPEG, daylight balance, manual focusing with Optec TCF-S, Backyard EOS, Paint.NET. North is up, east is left. 1:55. Shot another 20 second image. Got a nice shot. A and B were obvious. 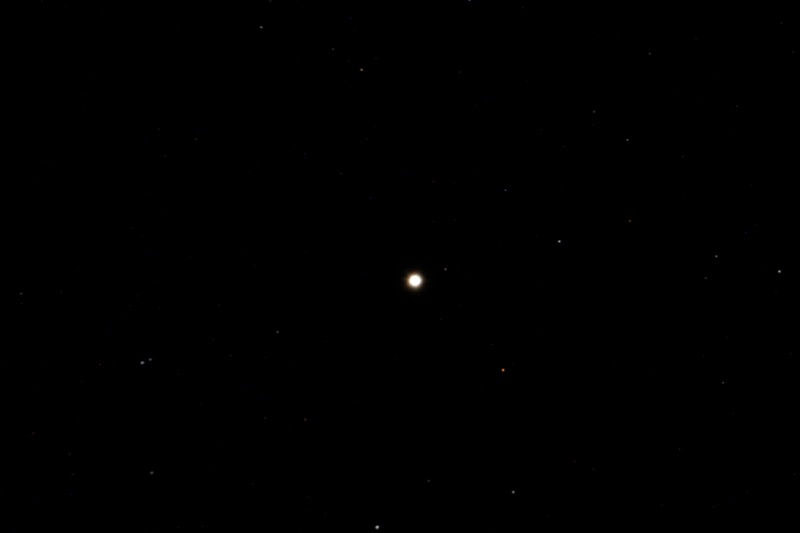 B is to the south (or below), well away, the top star of the L-shape. Faint. Reviewed my double stars life list. Next up: kappa Per. Tried a sync in TheSky but abandoned it. Oops. Forgot to name the target. Tried the abort in Backyard but it kept on shooting. Oh well. Named the second image correctly. B was obvious. Wide. On the way to Tycho 02859-0261 1. Kinda to the north. In the image, to the 2 o'clock position. Very different magnitudes. Almost the same magnitude as a 13.7 star. I fell asleep for a second. 2:10. Started shooting. Left it 20 seconds. Beep boop. I thought I could see all the companions! The B and C faint stars were at the 8 o'clock position while the D and E stars at 7 o'clock. BC are opposite the bright star SAO 38588. Hmmm. Kinda neat. There was some movement. The B and C were in a similar orientation to D and E in the image; the software showed them opposed, at 90 degrees. Shot again. Round stars. Not sure which is the brighter, D or E.
Slewed to Gorgonea Tertia. In my TLAO list. Went to Frame & Focus, fine-tuned the position. Noticed the FWHM read 6. Interesting. A different number apparently based on the star brightness. So does that mean one should use a particular star brightness for focusing? I was getting the impression it was an absolute. 2:16. 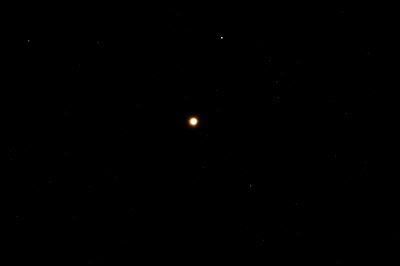 Shot ρ (rho) Persei for its colour, an M-class star. A variable, ranging from 3 to 4, over 50 days. Considered putting it against another star. Headed to δ (delta) Per aka BUP 46. In the camera field. Not bad. Shifted slightly. Started shooting. Nice star field. Got the B star. Uh huh. Good. It is well away along the 2:30 o'clock orientation. Noted there was a C star, 3 mags different. Dropped the speed to pull out the tight C companion. Realised I was still forgetting to rename the targets. 2:25. Shot for 5 seconds. B was still visible. B disappeared in the 1 second. Tried 1/80. Then 1/100. Bad seeing. Or mirror flop! Sped back up to 1/30. OK. Interesting. I had exhausted my Perseus targets. 2:30. Considered the comet in Cetus. A galaxy in Cassiopeia. Went to NGC 147 (aka Caldwell 17). Shot for 30 seconds. It was trailed, badly. Nice stars. Saw a shield or an arc of stars. Continued trying to compare the star field to views in the software. Slewed a bit. Went to ο (omicron) Cas. Looked at the offset. Slewed back to 147. The (clone) camera battery was holding up. I had things ready for departure. I did not see anything in the image... Juliet Charlie. I could not figure it out. Ridiculous. Tried to slew again. Frig! The Paramount started to flip. It was too high. I had run out of time. It was too far into the meridian. I had been resisting doing a flip to avoid primary mirror movement issues. 3:08. Heading to the house. Scanned for zodiacal light through Taurus and Cancer. No... Nothing obvious.